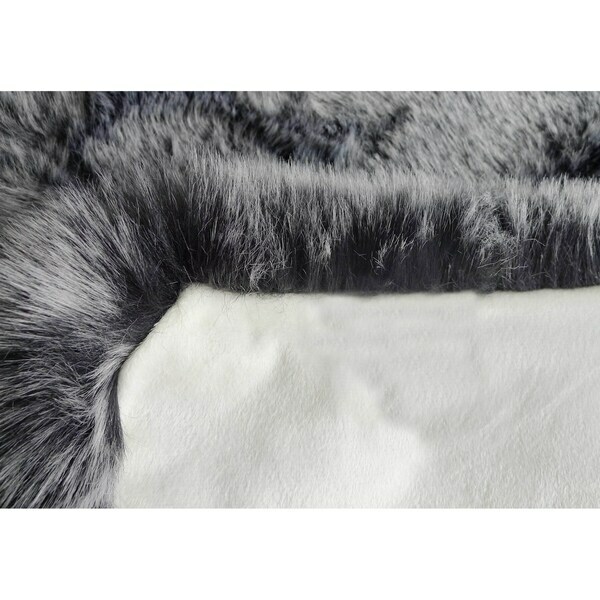 Gray Faux Fur Throw Rug - 50" x 60"
White Gray Faux Fur Throw Rug - 50" x 60"
Silver Faux Fur Throw Rug - 50" x 60"
Feather Faux Fur Throw Rug - 50" x 60"
This contemporary throw rug is easy to clean. This breathtaking faux fur throw rug has a 3 inch pile high thickness and a suede backing. This alluring piece will make the perfect new addition to your living room, bedroom, or any room. •	Excellent value •	Easy to clean •	Abrasion resistant •	Mildew resistant •	Stain resistant •	100% Polyester •	3 inch pile high thickness •	Made in China Exact size: 50" x 60" Questions, call our rug expert at 310-601-0021. Black Faux Fur Throw Rug - 50" x 60"